The year is 793 AD. Savage, heathen armies from the north invade Northumberland, for today is the day of the viking, but the night… The night belongs to something else. 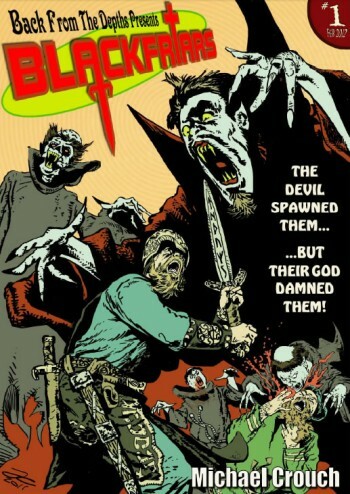 Now available as a PDF download, Blackfriars is a tale of vampires versus vikings byMichael Crouch. The first episode appeared in the 2010 edition of Hallowscream, with further episodes appearing on Michael’s blog in weekly instalments. The story is drawn in the style of a serial from the classic British “Scream!” comic. The cover is by John Caliber and there’s a short image gallery at the back of the collection with artwork by Andrew Milne, David Blankley, and Grant Perkins (with Mike Bunt inking and Owen Watts colouring).